I finished up the FatCatKnits BFL/silk (75/25) roving I had on the wheel this past week, in preparation for kicking off the Tour De Fleece tomorrow! I spun each of the individual colorways (which were 2.5 oz each) and then plied them together. I love the effect this created - a sort of stained-glass look. Roving: 75/25 Blue-faced Leicester/silk roving from FatCatKnits Mixed Blessings Club, Autumn 2011. No immediate plans for this, but it'll go in the handspun stash bin until I'm ready for it. At some point, I will finally be caught up on the bulk of my deadline knitting projects and can perhaps show y'all some of the knitting things, but until then..... I bring you Stitching Wednesday. I've got a handful of projects on the go and I'm participating in the Ivory Needle Challenge, which is to work on 5 projects with some focus, dedicating 6 days each month to work on those. So while I am doing that, I'm also spending a bit of time on some other projects that I'd like to get finished for various reasons. First up, right now, my 6-day rotation (which will take me to the end of the month on June 30th) is working on Village of Hawk Run Hollow by Carriage House Samplings. I've finished blocks 1 and 2 of the 12-block pattern, and I'm working on block 3. I'm making some tweaks to the originally charted design, and adding in some family information from my mum's side of the family - my grandmother's family, many of whom still live in Centre County, Pennsylvania. These blocks take a deceptively long amount of time. The brickwork/stonework sections in this are amazingly time-consumptive, but I'm plugging along on it. I've got the city hall building bricks and foundation left to finish, the flag, the birds in the upper left-hand corner, and then I have to go back through and stitch in the lettering in the sign. I'm not 100% sure I will have this finished by the time Friday comes and it moves out of rotation, but I'm putting some time in on it every day. I've also been working on a full-coverage piece: Star Weaver with artwork by Tom Cross and charted by Heaven and Earth Designs. This is one of their "storykeeps", i.e. bookmark sized pieces, so it's relatively small (ish) for a HAED. I finished page 1 up earlier in the month and since I'm focusing on finishing this one this year, I'm trying to put in an hour or so on it in the evenings when I can. After slogging thru almost an entire page of mostly the same color, I'm finally on to some different colored blues and am going to try to get at least to the middle of this page by the end of July. The entire design is 3 full pages and then 1 row of approximately 720 sts or so to finish it up. Finally, I've been working on a Mill Hill kit, the Pike's Peak Santa a bit here and there. 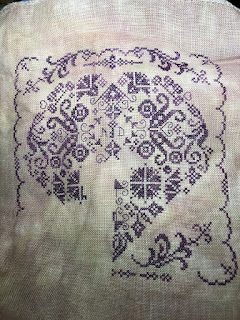 I've just finished all the plain cross-stitch parts, so I've got beading left to finish up on this. Planning to gift this to my DH as an Xmas gift this year, and I think I'll be able to get it finished up over the next month and have it ready to go when we get to the end of the year. I'm still working on The Underground Railroad by Colson Whitehead this week (week 8's theme: a book written by a person of color). An interesting premise for this one. The author writes as if the underground railroad was an actual railroad. I'm not entirely sure if I am finding this an intriguing metaphor, or something weird enough it's bothering me. Anyway. About halfway through this one and hoping to finish it this week before it's due back at the library. I'm also going to be starting a re-read of Pride and Prejudice as my week #23 book - a book from the BBC's "The Big Read". I've got this as an audiobook from the library as I enjoy listening to this sort of writing, so I've got that to enjoy over the next 2 weeks as well. I joined a new group on Goodreads, A Stitcher's Book Club. It's a lovely small group of like-minded crafters, and they have bimonthly reading challenges, as well as some other larger challenges. Not everything is stitching-related in terms of book topics, however, and in fact, I'm going to double-dip with P&P for their July read. Several of the challenges in this club overlap with the 2017 challenge, so I can double-dip for those as well. Check them out if you think it might be your sort of thing! Seriously y'all.... my blog has been really sorely neglected this year except for book posts. I'm going to try to remedy that the second half of the year, so I'm going to try to get back to my prior Mon/Wed/Fri posting schedule. Today being Friday, how about a spinning-related post? Tour de Fleece 2017 is almost upon us! It starts July 1st this year and runs thru the 23rd. I've participated in the Tour for the last 5 or so years, I think. It's one of the few things I look forward to in the summertime, since I am not a hot-weather person and we usually take vacations in the fall or winter months. I'm hoping to get my wheel freed up this weekend so I'm ready to go for July 1st. I have been slowly, ever so slowly working on spins from stash this year. Right now, I've got a club fiber from Winter 2011 from FatCatKnits on the wheel. It's a 75/25 BFL wool/silk blend. There were 2 colorways (as Ginny normally did for her Mixed Blessings Clubs), with 2.5 oz of each. The original roving is jewel tones - one warm and one cool colorway set. It's coming out like a pretty stained glass colorway. It might be just the thing to use with a dark purple or black solid colorway in a 2-color project when it's finished..... someday. As a carrot to help keep me motivated to get this done, I pulled a random braid from a bin this morning that'll be my first braid on the wheel for TdF. I'm not setting any specific yardage or ounces to spin goal. I'm just going to go for 30 minutes of spinning time a day and whatever I get finished, I get finished. First up: Pirate Jenny from Two If By Hand on superwash merino. I'm pretty sure I'm going to split this braid (which is dyed as a gradient) up and do striped yarn for socks. At least that's the current plan as of today - stay tuned. I finished The Dream Lover by Elizabeth Berg over the weekend. I enjoyed this one about the life of the author, George Sand. While I'm by no means an expert on Sand's life, it appeared that the author did a lot of research off primary source documents to develop her portrait of Sand and her contemporaries in the world of the French art circle - writers, actors, painters, musicians - and it felt like a "real" telling of Sand's life. The last third of the book felt a little rushed to me. I think I wanted more information on her relationship with Frederic Chopin. Their relationship is mentioned in almost every historical reference I've seen on Sand, but it didn't seem to have that same weight in the book. A nicely created world of early 19th century Paris as the backdrop for the story is a nice bonus. The Moon in the Palace by Weina Dai Randel. I read this for week #1's topic - a book from the Goodreads Choice Awards 2016. This book covers the early years of the Chinese courtesan who would become the Empress Wu. (There is a follow up book that follows her history after she is made empress, although I have not read that one so can't speak towards whether it furthers the tale or not.) A good read - I liked that it really developed the subcharacters in the Emperor's court and the intrigues and political turmoil going on. I also was happy to find a historical fiction that wasn't European - there aren't as many of those, so it was a nice change to read something in that genre that was outside my usual knowledge base. I'm always up for learning about different things. I'd be curious to see if the characters held up into the sequel, as that doesn't always happen. In fact, I may pick up the sequel for week 21, and see how it goes. Overall, a B+: Entertaining, interesting, easy read. I then picked up Longbourn by Jo Baker for week 4: A title that doesn't contain the letter "E". This book is a sort of upstairs/downstairs retelling of Pride and Prejudice. The author has used all of the pivotal story points (like the ball at Netherfield, the elopement of Kitty and Wickham, etc.) but has written the tale from the perspective of the servants in the Bennet household. Smart, well-written and researched, with a LOT of historic information hidden away in subtle corners, I really enjoyed this one. The back story behind the housekeeper is worth the price of admission alone, but I also appreciated that the author expanded the story beyond just the house at Longbourn to cover some good historical tidbits about the Napoleonic Wars. Definitely recommended for Jane Austen fans! This week, I'm reading The Dream Lover by Elizabeth Berg. I'm not too far into this, but it's a historical fiction piece about the life of George Sand, which I'm using for week #25. More to come on that once I've finished it.